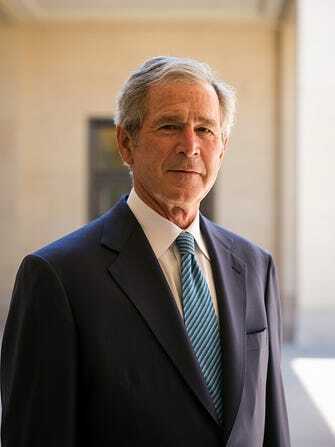 Photo: Courtesy of the George W. Bush Presidential Center. When we first learned that George W. Bush could add artist to his long list of of illustrious titles, we were naturally pretty surprised. Turns out, this isn't just a hobby. According to People, the former prez is blending his love of politics and painting in a new exhibition called "The Art of Leadership: A President’s Personal Diplomacy." The show will open in early April at at his presidential library in Dallas, TX. The exhibition will showcase over two dozen portraits painted by Bush. How does this relate to politics, you ask? According to the George W. Bush Presidential Center, the portraits will “explore the relationships that President George W. Bush forged with world leaders.” No sneak peeks yet, but we’re anticipating colorful portraits of the heads of state Dubya worked with during his time in office.